Become a Member of SGGS ! Although SGGS' primary purpose is outreach to the genealogical public, joining SGGS as a member will provide the following additional benefits. ​SGGS membership uses an annual membership year model that runs from July 1 through June 30 of the following year. If you are a new member, when you join will determine which membership year you are purchasing (current one or the next one that begins July 1). New members! Click here for more information about the membership year. Dues are payable in U.S. Dollars. Non-U.S. residents please note that currency conversion is built into the online form which uses the payment service PayPal. Enter your membership selection and contact information into an online form. When you press the form's SAVE button, you will be sent to the PayPal online payment screen. There you can pay using your credit or debit card. Note that not all credit and debit cards are accepted by PayPal. For non-U.S. residents, PayPal does currency conversion. Use of this payment service is free. If you provide an email address, you will receive an emailed receipt from both SGGS and PayPal. After completing the online process, your membership is immediately received by SGGS. No mailing delay. No worries about mis-delivery. 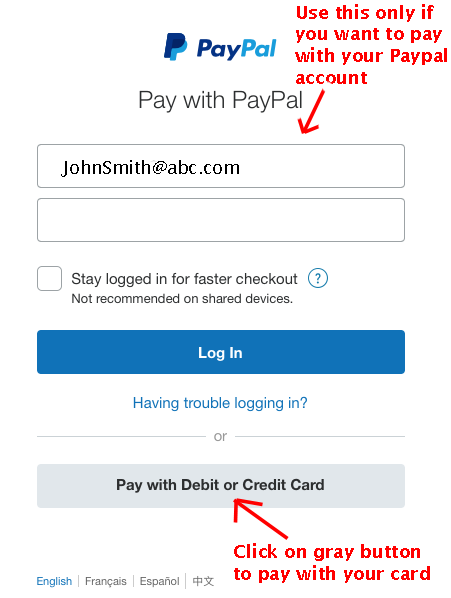 You do not need to open a PayPal account to make a payment using your credit or debit card (ignore any promotional ads). Click here to display the online membership form. 1) Print out and complete the one-page membership form. 2) Make check or money order payable to "SGGS". First, fill out the membership from. Use the form from the yellow brochure available at meetings or download one from this website. Click here to download the form. Provide the filled-out form plus the payment to the Membership Director who will be located behind the membership table near the meeting room's entrance. Selected SGGS volunteers using their personal smartphones can accept credit or debit card payments. See the Membership Director behind the membershp table. There is no charge for using your credit or debit card. Payments are processed by Square. Click here to see the payment cards accepted by Square. You will be asked for a signature. If you also provide an email address, Square will email a receipt. SGGS cannot guarantee the availability of this service since it is dependent on said volunteers being present and their equipment being in working order. I've Just Joined. What Happens Now? You will be able to make use of your new membership or membership renewal after it is processed by SGGS. Processing is typically completed within a few days of receipt of your membership, although volunteer vacations can occasionally stretch that to a few weeks. Click here for a list of what happens next and your follow-on options. If you have any questions about membership, click here to email the Membership Director. If you would like a membership brochure mailed to you, please include your complete postal address. Thank you for being a member of SGGS ! When you purchase a typical annual subscription to a magazine, your subscription renewal date occurs exactly one year after the date of your original purchase. But most all-volunteer genealogy clubs like SGGS use the membership year method. Under a membership year plan, all members have the same membership renewal date, the one exception being if a multiple-year membership was purchased. SGGS' membership year begins on July 1 and ends on June 30 of the following year. For existing members, membership renewal reminders for the next membership year are sent out at the same time each year – May and June. For those joining as new members, when you purchase the membership determines which membership year you will be getting – the current membership year or the next one. See the following table for details. New members are purchasing the current membership year. Any previously mailed Der Blumenbaum issues will be sent to you. You will then receive all subsequent issues for the remainder of the current membership year that ends June 30. You join on January 24. Since you are purchasing the current membership year, three already mailed Der Blumenbaum issues are sent to you (July, October and January issues). You will receive the future April Der Blumenbaum at the same time as all other members. Sometime in May you will receive a renewal reminder for the membership year beginning July 1. New members are purchasing the next membership that begins July 1st. You will receive a complimentary April issue followed by all four issues of Der Blumenbaum for the next membership year. You join on May 25. You are purchasing the next membership year that begins July 1. So you will not receive a membership renewal reminder until May of next year. To keep you informed until your new membershp year begins, SGGS will mail a complimentary copy of the April Der Blumenbaum (last issue from the current membership year). Membership – What Happens Next? If you provided a working email address (strongly recommended), immediately after your membership is processed you will receive an emailed new membership purchase confirmation letter. That letter includes your website log-in name and password. Confirm that the other information on the letter is correct (especially your mailing address) and contact the Membership Director if any changes are needed. Login to the members-only section of the website using your new log-in name and password. Then change the assigned default password (and log-in name if desired). The FAQ page in the For Members Only section describes how to do this. Note that log-in name must be unique across all members. View your online member record to check that the information posted there is correct. Browse information in the For Members Only section of the website. From inside your member record, you can start enter ancestor surname information that will appear on the "Surnames Query" page in the public area of the website. Send in a pedigree chart that will be indexed and posted in the set of binders made available for browsing by meeting attendees. See the Pedigree Chart paragraph on the Member Services page for more information. Review the "Member Services" page in the members-only section of the website and consider making use of the member benefits described there (e.g., putting a query in the next Der Blumenbaum). Within on month of your membership being processed, you will receive a new member packet by postal mail. That packet includes some useful German genealogical handouts plus any back issues of Der Blumenbaum that you are due. Once you become familiar with SGGS, please consider becoming a volunteer to help the society function. A partial list of such needs can be found on the "Help Wanted" page in the For Members Only section of the website. If you provided a working email address (strongly recommended), immediately after your membership is processed you will receive an emailed membership renewal confirmation letter. Confirm that the other information on the letter is correct (especially your mailing address) and contact the Membership Director if any changes are needed. View your online member record to check that the information posted there is correct (especially if you provided contact information changes during renewal). Now is a good time ensure that your pedigree charts and surname lists are up to date. Second Member of a Couple Membership – Both online and paper membership forms provide for entry of a single email address and phone number. Those are associated with the "primary" member of the two people who constitute a Couple membership. And one log-in name and password is automatically assigned. The system includes a provision for the second member of the Couple have a separate email address, phone number and log-in name/password. If that is desired, please contact the Membership Director requesting such and providing the second person's contact information. The Membership Director will assign the second log-in name and password. Upgrades – Upgrading your membership plan to a more expensive one is possible by contacting the Membership Director and paying the difference in the dues amount. For example, a U.S. member upgrading from bulk mail to the First Class mail costs $9. Upgrading from an Individual membership plan to a Couple costs $5. Seasonal Address – If you split your time between two residences and wish to receive Der Blumenbaum at the applicable residence when you are present, then contact the Member Director to set up a seasonal address. Only one seasonal address is supported. Provide the address, month of your arrival and the month you will be departing. Note that Der Blumenbaum labels are printed within one week either way of the issue date. For example, labels for the April issue may be printed either in late March or early April. 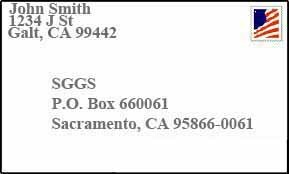 And depending on which mailing method you choose and your distance from Sacramento, mailing transit time may range from a couple days to several weeks. Click here to go to the supplemental payments page.